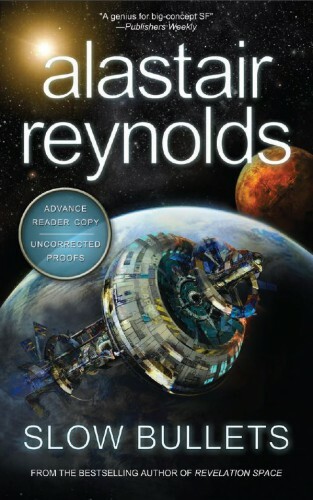 This April the third book in the Poseidon’s Children series by Alastair Reynolds, Poseidon’s Wake, is set to be released. Afterwards the novella, Slow Bullets, will gets its turn. The tentative release date is June 9th and this is an advance review. For those who are fans of Chasm City or his novella series Diamond Dogs and Turquoise Days will find Slow Bullets to be very satisfying. Slow Bullets takes place in the far future in a universe that resembles Alastair Reynolds earlier work. Yet, there are subtle differences with Revelation Space. For one thing faster than light travel is possible. ‘Skipping’ as it is called causes the hibernation ship Caprice to veer of course and out of time. The ships inhabitant are mostly soldiers from two different factions. They have just ended their bloody war with an armistice and expect to be repatriated. Among them is Scur, a soldier who admits she should never have been conscripted. She wants to desperately go home to end a bitter dispute with her family. When she wakes from her hibernation chamber she discovers more than a thousand years have passed. Scur’s position becomes even more complicated when she discovers that her arch enemy Orvin is also onboard Caprice. 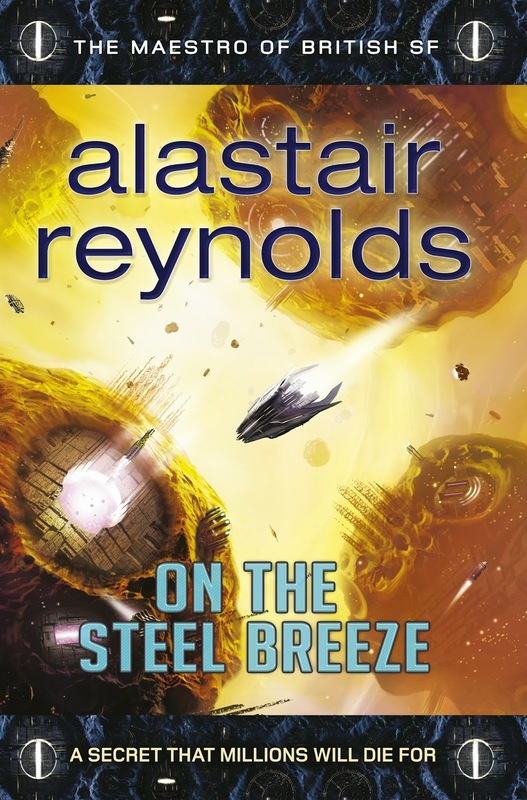 Alastair Reynolds revisits a number of familiar themes with Slow Bullets. In the universe in which this novella is set human civilization has been reduced by a mysterious alien race. Their intervention has stopped interstellar space travel and caused a degradation of technological sophistication. The main protagonist, Scur, may or may not suffer from memory loss. As we see everything through her eyes the doubt remains whether she is truthfully describing events. Readers of Chasm City will remember how Tanner Mirabel slowly recovered memories of his dark alter ego Sky Haussmann. Scur seems to have a similar dark past that she is reluctant to share with the audience. The Slow Bullets the title refers to are implants that keep a record of a soldiers life. Scur is reluctant to give up this past, even when a plan is put forth to save the Caprice when it suffers computer memory losses. The novella thus continues another common theme of Alastair Reynolds work, that of reflection on identity and the ramifications of using technology to alter one’s identity. The main antagonist, Orvin, uses Slow Bullets to torture his victims. Orvin is a sadistic maniac who is hated even by his own side. In many ways Scur fears becoming like Orvin. She makes every effort to catch him after his failed attempt to kill her for his own amusement using a slow moving bullet as a torture device. Her greatest fear is that she will lose her old identity when she finally does catch up to Orvin onboard Caprice. Meanwhile her fellow passengers are more worried about the world known as Tottori which Caprice is orbiting. Industry has all but vanished leaving just 50 million people living off the land at the equator. With no hope of quickly building up civilization they have the added worry the ship’s systems are slowly overwriting its database of culture and science in an effort to try and save the ship. As the passengers scramble to preserve as much information by writing it all on walls disagreements break out over religious texts knows as The Books. Before long Scur will have to make a decisions regarding preserving her own past to keep the peace and the ship intact. 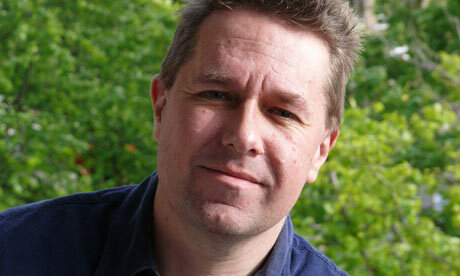 At 40.000 words there is little room for the usual exposition that has lent Alastair Reynolds the title Maestro of Science Fiction. Slow Bullets is not hard SF but it does try to highlight the requisite scientific principles that allows its universe to work. As it is a novella the story suffers from the need to rush through events without properly explaining them. Too often I hear the author’s voice and not logic. Too often Scur decides on a course of action that even she doubts she should make. Most can be explained away because of the need to keep pace with the novella’s short length. However, at the end the author’s voice returns to try and make the reader doubt whom Scur was. It doesn’t work. It feels like an ending that Alastair Reynolds envisioned early on and could not abandon. Slow Bullets is not a perfect story, but the continuous suspense is palpable right from the start. The quick changing circumstances in which Scur and several hundred survivors find themselves onboard Caprice keeps the story vivid but comes at the cost of logic. This was Slow Bullets by Alastair Reynolds Review. I hope you enjoyed reading it. Drop a comment below if you disagree with me or if you want to ask a question. Score; 8.7 / 10. A wonderful novella that will tie over fans of Alastair Reynolds with his next space opera. Currently Slow Bullets can be pre-ordered from Amazon.com for $11.53 for the paperback edition.